If there is one game Jeremiah Jackson points to as the first giant step forward in his professional career, chances are it will be Thursday night's performance. The No. 15 Angels prospect matched his career high with three hits, tripling twice and homering while scoring three runs and driving in two more as Rookie-level Orem defeated visiting Missoula, 12-7. The three hits equaled Jackson's total from his first four games in the Pioneer League, during which he'd gone 3-for-19 with eight strikeouts. "It took a little bit of adjustment here in my first few games," the Angels' 2018 second-round Draft pick said. "It was actually a bit of a shock to come from playing down in Arizona in front of a few fans to a stadium pretty full. It's a different feeling. But my swing has felt fine ... I was just missing some pitches to hit. Tonight, it came together." 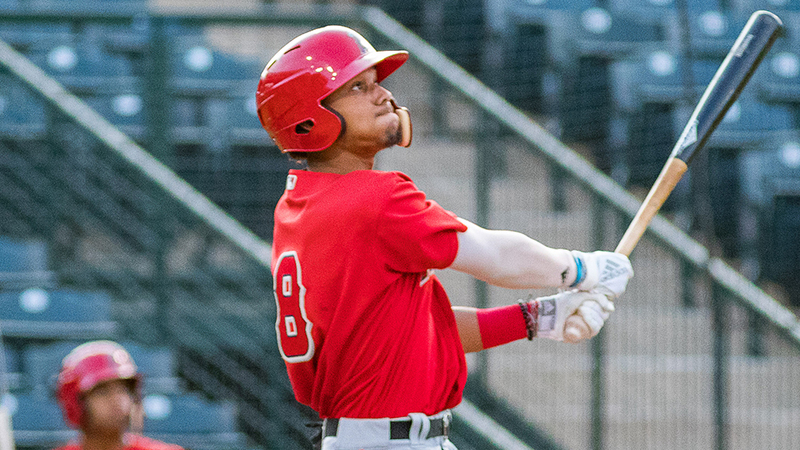 After clubbing five roundtrippers in 21 games in the Rookie-level Arizona League, the 18-year-old homered to left field on the first pitch he saw leading off the bottom of the first inning. He struck out in the second, then ripped an RBI triple to right and scored during Orem's six-run third. After walking in the sixth, Jackson raced for his second three-bagger of the game to right to start off the eighth. He scored his career-high third run on Jordyn Adams' ensuing single. After spending most of his time as a three-hole hitter during high school, Jackson has been put into the leadoff role during his early days as a Minor Leaguer. That doesn't mean he's changed his approach, however. "I'm used to going up there trying to get the run home," he said. "So I have the mentality that if I get a pitch to hit, I'm going to go after it. As a leadoff guy, nine times out of 10, you're going to see a first-pitch fastball. That's what I was looking for and that's what happened tonight. I trusted my hands and let it rip." Jackson's big night raised his average with the Owlz more than 100 points, from .158 to .261. Overall, the native of Mobile, Alabama, is batting .305/.368/.590 with 14 extra-base hits, 18 runs scored and 16 RBIs in 26 games between the two leagues. The shortstop got off to a blazing start in the Arizona League, where he hit .317/.374/.598 in 21 games. "This has been a great ride so far," Jackson said. "I was drafted by a good organization who treats its players very well. All the coordinators and coaches work with us and help us every day. It's made it pretty easy for me to jump right in and start playing. There are a lot of differences from high school, but at the end of the day, it's just baseball. As long as I go out there and play the game the right way, I'm confident I'll succeed." Adams, the Angels No. 6 prospect and the team's first-round Draft pick in June, drove in a career-high four runs and fell a homer shy of the cycle. No. 21 Nonie Williams and No. 25 D'Shawn Knowles also went deep for the Owlz. Starter Matt Leon (2-3) allowed four runs on 10 hits and two walks with two strikeouts in five innings to pick up the win. D-backs No. 6 prospect Alek Thomas -- a second-round pick this year -- hit his first professional homer, doubled and drove in three runs for the Osprey. Zachery Almond had three hits for the fourth time in seven games while Zack Shannon went 3-for-5 with three RBIs.